Richard has over 25 years of business development and marketing expertise. He is the founder of two software development companies and has over 10 years of nonprofit experience serving at various levels bridging both staff and board functions. He consults nonprofits in the areas of marketing and organizational development, earned a Bachelor of Business Administration from Western Michigan University, and a Master of Nonprofit Management from Regis University. With a natural love of the outdoors and outdoor activities, Richard is an experienced skier, climber, and mountain guide; a twelve-year field-active team leader with Alpine Rescue Team, serving as President, Training Director, and as Chairman of the Rocky Mountain Region of the Mountain Rescue Association, he has resided in Evergreen, Colorado since 1990. On December 12, 2014 the Denver Post published "Evergreen fire adds fees for first response" by Josie Klemier. The article detailed The Evergreen Fire Protection District Board of Director's decision to approve a fee schedule for 2015 to charge nonresidents for response to motor vehicle accidents and other emergencies. The article created a bit of a stir and incited a fairly excited cry of confusion with a bit of outrage over our local social media. Because the article only reported the outcome of the decision, I decided to dig a bit deeper into the background that led to this choice. Personally, I find the EFPD board's decision to charge for services at motor vehicle accidents to be short-sighted. I spent 12 years as a volunteer with Alpine Rescue Team, a nonprofit search and rescue organization located in Evergreen. I was also involved both nationally and regionally with the Mountain Rescue Association. Across the nation, search and rescue has a firm policy against placing blame and in charging for rescues of any kind. I have been involved in promoting that policy on more than one occasion. I started the Facebook page No Charge for Rescue and also, with others, authored the winning argument that persuaded the Golden City Council to abandon charging for rescues in recreation areas by their fire department. I believe decisions like this one present a slippery slope, which could easily lead to other incidences of charging for other services. More importantly, I do not feel this decision adequately reflects our community values or presents our community brand in a positive light. As more policies like this roll out across our state, I believe we are going to see more problems than solutions. That said, it appears acceptable forethought entered the decision. I'll leave it to you to determine if there is adequate justification. Kudos to our Fire Chief Mike Weege. After requesting financial information about the district, Chief Weege took it upon himself to learn about my concerns and to answer all my questions regarding the decision. I'm happy to provide our unedited correspondence. If you are interested in reading the email, send me a note and I'll fwd you the correspondence. Following are some of the highlights of our correspondence. Authority: House Bill 11-1059 Gives fire protection districts the authority to bill for extrication, rescue or safety services in furtherance of ambulance or emergency medical services. Financial Condition: The district is legally not allowed to operate in the red. The 2013 EFPD Audited Financial Statements reported assets in the amount of $10,907,659 with capital assets representing about 70% of that number, a fund balance of $259K, and unrestricted assets of $3,425,488. Organizational Assessment: "The district has organized two separate focus groups over the last four years. One was to discuss the EMS billing fees and alternate EMS fees, and the second was to help develop the 2014 Strategic Plan. Both groups were made up of business owners, HOA representatives and home owners in Evergreen. Both of these groups asked us to leverage fee schedules to offset rising costs before going to the public for a mill levy increase." Concerns About Revenue: "We are very concerned over our budget situation. Since 2010, we have seen a 12.4% drop in our property tax revenue. This has resulted in us cutting programs and other costs significantly. Not being able to make the scheduled deposits into our reserve fund has a significant impact on our future needs." "The concern over revenue is mentioned several places throughout the Strategic Plan. One page 57, on page 38 under Planning Assumptions, in several of the division plans and is shown in Driving Factors of this Strategic Plan and listed as one of the concerns of the focus group on page 5. As you know, the housing bubble burst in 2008 started to affect us after 2010 and our revenue has been down each year after that. Is is projected to be down again in 2015 and as 2015 is another property valuation year, we are hoping the trend reverses as we are currently seeing homes sales increasing and construction projects starting again." Revenue Generation: "In 2013 we ran on 129 MVA. Our estimates were that we could generate between $30,000 and $50,000. This doesn't seem like a lot against a $5M budget but with the many other revenue sources we are identifying, it adds up. For example, we are working hard on developing firefighters for wild land fire deployment, which are paid deployments and can/has brought $50,000 in revenue. We are dispatching for five other mountain fire departments now and that is bringing in $80,000 – $100,000 a year." EMS Budget: I should explain further the EMS budget. EMS's annual operating expenses are between $1.8M and $2M. The invoicing for transports is about $1M a year be our actual receipts are only about $560,000. This is mainly because Medicare and Medicaid only pay a small percentage of the bills we send them. One pays 30% and the other pays 7%. We are not legally able to bill the individual the balance so we have to write off the difference every year. To me and others in the district this decision seemed abrupt; I leave it to the reader to determine whether $30 to $50K of potential revenue against a $5 Million budget outweighs the potential for lost community goodwill. I'd encourage anyone who wants to learn more to contact Chief Weege or to attend the district's monthly meetings. The original purpose of this site was to offer a fresh viewpoint on the topics of nonprofit leadership, holistic marketing, fundraising, and organizational development. I titled it Hip Tips and my goal was to present interesting and insightful information, ideas, and points of view that would stimulate and motivate nonprofit/NGO's to strive for excellence. After close to three years of posts, I hope I've acheived that goal… if only just a bit. I plan to continue expressing my viewpoints on nonprofit management and so I've moved my Hip Tips posts to my business page, www.questusstrategies.com. Today, this blog takes on a new direction. I'll be shifting gears in order to spread my wings and expand my writing portfolio. I plan to stretch myself in new directions, by expressing my thoughts in new ways, by trying new things, experimenting, pressing the envelope. I hope to present my views on things that matter. But not always, because sometimes, a little leavity is important. Sometimes diversion is necessary for focus. Largely, I plan to reflect on my experiences and offer opinions of importance regarding relationships and freindships, art, politics, travel, culture, and life in the mountains that produce dreams of the ocean; all sorts of reflections from a well-worn life. In my last post, I addressed the importance pictures play in an effective content marketing strategy that works to tell a compelling nonprofit story. We have often heard that a picture is worth a thousand words, but what's more important is that words and pictures can work in harmony with one another. There are so many ways to say something. Just the other day, I mentioned to a client that I'd be happy to help explain the strategic plan we'd just developed to the staff. I was just trying to help, but the response I received was to the effect of, "I really don't think I need anyone to hold my hand." Once again, I learned the hard way that words count. They need to be in the right order, have the right inflection, be succinct and genuine. Most importantly, in today's Internet-fueled world, they need to cut to the chase. That's because we are bombarded by thousands of messages daily. In a world where 141 characters is too many, we need to be efficient to be effective. Create an emotional connection with your audience. Emotions drive decisions and they create loyalty. In getting to know someone, some of your first questions are: where do you come from, what do you do for a living and how many kids do you have? The same types of questions are relevant when someone wants to get to know your organization. Speak to directly to your audience and in their language; anticipate and answer their questions. Your goal should be to become the authority in your space. Create content that addresses not just you, but the community you serve. When possible, tell a story. What's the mythology of your organization? Why do you do what you do, what connection does it have to your stakeholders, how does it affect the lives of the people you serve? Don't forget to include stories about the success you create in your space. In research done by Disruptive Communications, over forty percent of people expressed that poor spelling and grammar lowered their impression of a particular brand (that's what people think of when they hear your name). Yes, you're on a budget, in both time and money, but try to invest a little more in ensuring that your content hits the mark. I guarantee it will pay off in the long run. Think dynamic rather than static. Work to keep your message lively; switch your story up from time-to-time. Your value proposition may not change, but how you express it can. Keep your audience interested and engaged with new stories, pictures, and valuable information. All too often, in the quest for keeping expenses to a minimum, nonprofits spend little to nothing when communicating with their target audience. How we express ourselves is pretty darned important. In marketing our nonprofit organizations, our words count. In working to encourage donors to invest in our cause, our words count, in getting volunteers to go the extra mile, our words count. Your mission is important and how you express it to your community is just as important. Content Marketing and Your Nonprofit! According to Great Nonprofits, there are 6,978 nonprofit organizations in the Denver area; each is special in their own way. But, with that many organizations vying for attention, we must ask ourselves two important questions: 1) Do you want to blend in, or do you want to stand out? 2) Do you want to look "pretty" or do you want to be effective? Content marketing offers the perfect platform for nonprofit organizations to set themselves apart from the crowd. According to the Content Marketing Institute, "It’s a marketing process to attract and retain customers by consistently creating and curating content in order to change or enhance a consumer behavior." Today, content marketing includes everything from thought-provoking blog posts, to relevant pictures, informative infographics, and engaging social media projects. It is a marketing technique of creating and distributing relevant and valuable content to attract, acquire, and engage a clearly defined and understood target audience – with the objective of driving positive audience actions. When you’re looking to influence people and build a powerful online presence, authority is the way to go. People respect other people who have authority, expertise, and impressive credentials just like they respect people in lab coats and police uniforms. And, they respect authority even more when you demonstrate it rather than simply claiming it. Content marketing allows you to position yourself as an authority in your space; because when making a donation, donors want to learn before they contribute, and they want to be assured their donation is well spent. If you're the authority in your field you're more than halfway there. In future posts we'll examine content marketing in more detail. In the mean time, if you have questions, don't hesitate to contact Questus Strategies for consulting ideas on how to fuel your Internet marketing for greater awareness, engagement, and funding opportunities. Over the years, I've run across examples of inertia among businesses and organizations that some might explain as a little nutty. The machine is not exactly humming along and things aren't going quite right. No one seems to know why, but they're not attempting to learn more, as they dig in and continue doing the same things over and over again, expecting it to get better. I imagine most folks have heard about Albert Einstein's “Theory of Relativity”. I suppose, not as many have heard his definition of insanity, "doing the same thing over and over again, expecting a different result. Einstein was a physicist and so he understood the laws of physics, like Newton's 1st Law of motion. This law also known as Inertia states that an object either at rest or moving remains that way until some outside force interferes. So understanding Einstein's background, it makes perfect sense that he would describe insanity as such. When applied to the business world, there's sort of a yin and yang to Inertia, it can be positive or negative. If properly leveraged, you’re sailing along and things are going great. But, if it is not working in your favor, you might find yourself unable to get moving, or worse yet, unable to apply the brakes to escape the inevitable. The first step in overcoming the brunt of “bad” Inertia is recognizing your situation; understanding that maybe you're on a runaway rollercoaster. The signs are often difficult to spot. They may include a subtle decline in revenue or membership, perhaps volunteers are nowhere to be found, your staff may be slowly abandoning ship, or stakeholders just seem unmotivated. In some cases, all you know is that something is not right, but you can't quite place your finger on the issue. If any of these signs are nagging at your psyche, here are three things to help you to refocus. Let’s accept that it's easy to get sidetracked. So, going back to the source of what you're trying to accomplish is a great way to refocus. What's your vision of the future; for both your community and your organization? When everyone is in agreement and focused upon those shiny goal posts in the distance, you can overcome inertia and your tendency to just keep doing the same things over and over again, just because they’re familiar. Strategy First – Tactics Second: Tactics are easy to get your hands around; they're tangible, and actionable, with clear borders. What three things would you do to increase revenue; would you lower price, offer more services, or advertise more? Adjacently, strategy can be quite amorphous. Not long ago, I saw a group thread, which asked about best practices in moving from tactical to strategic; I quietly chuckled at all the tactical responses. As a result, I became curious and “Googled” strategy. I was surprised to not find an adequate answer to enlighten my curiosity. So, I return to my bottom line: think in broad, high-level terms. For instance, in order to grow, should we get bigger, or better? With the resources available, what can we realistically accomplish in say, the next 18 months? Then, drill down and start focusing on those things that reinforce your strategy. Way back in 1954, Peter Drucker outlined Management by Objective (MBO) as a participative goal setting process that creates a hierarchy of actions to drive a particular outcome. Here's the Hip Tip, don't fall into the trap of the quick fix; it never hurts to step back and assess from 30,000 feet. Measurement: All too often, one of two things happens with your plan. 1) It sits on a shelf and collects dust; 2) It becomes a ball and chain that binds you to a runaway train. Another principal tenet of MBO to apply is to set up a system to measure actual performance and achievements against your defined objectives. Did cutting your price in half triple sales, membership, or your service offering? If it didn't, all you're doing is splitting your revenue in half. You need to set targets and determine whether what you are doing is making the desired progress. Putting a measurement system in place can set guidelines for success. It can also help you identify whether you're in or out of that rut and whether inertia is working for you, or against you. Remember, change is good and healthy; it's the cornerstone of most successful businesses and organizations. Revisting what you're trying to accomplish and setting goals and objectives to achieve that vision will help you to refocus, and with a little luck, keep things lively, so inertia works in your favor. I often feel like I'm walking on egg shells when using a term like competition. Language like it is often viewed as foreign in the nonprofit community. That's because collaboration, impact, and the common good are uppermost in all our minds. But, competition can be good; it pushes innovation and inspires progress, and competition can be friendly. Understanding competitive advantage is about two things: 1) what it is you do best, and 2) how you fit within your community of service providers. Considering these factors gives you the ability to better connect with your audience to improve funding and to better your position in the community by improving service options. I've been following several topics in the LinkedIn group Strategic Planning for Nonprofits lately. As someone with a natural curiosity and full well knowing this is a controversial topic, I posted the following question to the group: "What level of importance do you place on understanding an organization's competitive advantage in strategic planning?" The comments flowed as though from a wellspring of enthusiasm and while I thought they would fall distinctly into two camps, by and large, I was pleasantly surprised. In the contrary camp, comments included: "I don't usually use the term "competitive advantage" in this context, because I think it's more illuminating to say how one's organization fits into the landscape of others addressing an important community issue." Another comment stated: "I would add that in the nonprofit arts world organizations bridle at the word "competitive" so I often use the term "comparative advantage." Then, there was: "Swallowing to get past "competitive", there are several questions that funders silently ask that come close." On the other side of the coin: "Other than Mission and Vision, I think that Competitive Advantage (Differentiation, Value Proposition, Uniqueness, etc. – they all mean essentially the same thing) is the most important consideration when doing strategic planning." Another said: "Being able to articulate how you are different and/or better than others is important to winning funding." One of the more compelling comments stated: "Sadly, I find engaging non-profits in discussions regarding competitors to be challenging at best. I have encountered resistance to the use of business terms or concepts, as if doing so would somehow soil the purity of the group." This commenter went on to further illuminate his frustration with the following: "Adopting business concepts is viewed by some as cavorting with an enemy who somehow is responsible for the ills that the non-profit is trying to address." I think we all agree that impact to the community is the priority, because without it, then what's the point? However, it's important for every organization to distinguish between what it is they do best and how well they perform (outcomes). Competitive advantage and impact are two different things. Outcomes demonstrate your value to the community and help you get better at what you do; while an understanding of your competitive advantage positions you among service providers and works to prevent overlapping services, which can dilute impact. A final short, sweet, and poignant comment concluded: "Whatever you call it, it's vital." And, that's the primary message I'd like to leave you with; whatever it is called, competition has always been present and it's here to stay. Those organizations that do not understand what they do best, or that embrace that difference, place themselves at a serious disadvantage. While collaboration is not new, it certainly seems to be gaining momentum. Perhaps that's because more and more people and organizations are discovering that together we're not only stronger, but we're smarter. I experienced a genuine buzz of collaboration at the Colorado Nonprofit Association's 21st Annual Fall Conference and collaborated myself with my good friend and colleague Rachel T. Emmer. She is a frequent collaborator at Questus Strategies, where we've assembled a cadre of strategy architects who take a team approach to projects exactly for those aforementioned reasons. For the conference, she and I presented two separate workshops: "21st Century Website Realities" and "Foraging for Funding, Creating Social Enterprise." Social Enterprise was on the tip of everyone's tongue at the conference. Many nonprofits are exploring earned-income possibilities while social benefit-oriented companies look to forge social good out of a business model. Unfortunately, according to Bloomberg, 8 out of 10 business entrepreneurs fail within the first 18 months. In a recent Forbes article Five Reasons 8 Out Of 10 Businesses Fail the article points to the "inability to nail a profitable business model with proven revenue streams" as a major factor. That's why our Foraging for Funding workshop presented a process for vetting ideas for further feasibility study. Using a World Cafe format and some innovative decision matrix tools, participants worked through the process of how to sort through a myriad of business ideas. We were pleasantly surprised to overhear several people exclaim: "Best workshop so far!" Having started several businesses, I know half the battle is in the preparation and planning. The Forbes article also points out: "No real differentiation in the market (read: lack of unique value propositions)" and "Failure to communicate value propositions in clear, concise and compelling fashion" as two other reasons businesses fail. That's where 21st Century Website Realities offered tips on how you can leverage content marketing strategy and use your website as the hub for all your marketing activities. Today, when someone wants to learn more about your organization, the first place they go is your website. Yet, even with the importance of making a favorable first impression, it's remarkable how many sites fall flat. You only have 8 to 10 seconds to capture a reader's attention, so it's vital to make the most of it. While building credibility with a contemporary, professional-looking site is essential, what's most imperitive is engaging your audience, that often means having something both powerfully moving and relevant to say. By answering the following: What do you do? Why is it important? And, what's the impact to the community? You begin to build a relationship that answers the most central question of all: "Why should I give you any money?" Content marketing leverages our basic need for stories and deeper connections; by listening, conversing, and teaching instead of pitching, you set your organization up as an expert in your field and that encourages people to return time after time. I've been on a soapbox talking about these ideas for a while now. But, I must say I felt pleasantly validated when Tuesday's keynote speaker, Susan McPherson, SVP & Director of Global Marketing for the NY, NY Public Relations firm Fenton echoed our advice. Two things are critical in mission achievement; emotional connection and community engagement; it's effective storytelling that gets you more than halfway there. You can find our presentations on the Questus Strategies website and soon we'll have complimentary ebooks available to help you get the basics in place. It must be the time of year, because lately I've seen several posts on strategic planning. Some have evocative titles like: "Does Strategic Planning Matter? ", or "How Do We Keep the Plan off the Shelf?” Others are much less suggestive, placing their emphasis on tactics to make the process better. So, I guess I'll chime in too. Over the years, I've heard my fair share of discussion around the pros and cons of strategic planning; some profess that it's the process, others the plan. Often the discussion revolves around tips, tricks, and engagement tactics for stakeholders. Perhaps that’s why I usually hear such a big sigh of dread surrounding the planning procedure, with questions like: is it THAT time again? Or, how much time is it going to take? I think this trepidation springs from two things: 1) not understanding the process, and 2) all the emphasis on engagement tactics and methods rather than strategy. 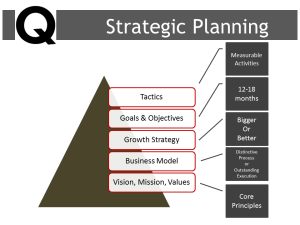 So, let’s take a closer look at how to place the emphasis on the strategy in strategic planning. If you boil it down to its essentials, strategic planning can be pretty simple. It's all about determining how to best grow your nonprofit or social enterprise to maximize impact and social good. If you think about it, there are really only two forms of growth: 1) bigger or 2) better. Sound too simple? It's not; you want your organization to continuously move forward and at some point you need to decide on where to focus that growth based upon resources. Setting a goal of bigger sends you in one direction, while setting a goal of better sends you in another. In either case, you have a basis for creating objectives to achieve your organizational development goal. Ok, so now that I've made it sound simple, I need to explain there's just a bit more to it. The second step to understanding strategic planning is to recognize it’s foundational, like a layer cake. You can think of it as a pyramid, where there are several stratums, each built and relying upon the one below. Each level has to be fully formed and strong enough to support those above. At the base you have your core principles. On top of these foundational principles is your business model. What do you provide, how do you provide it, what makes you special, and where do you fit in the community? Then, to this you add your growth strategy. These three things give you your primary foundation. With an understanding of your environment and your direction set, you can now establish your goals and objectives, which lead to your tactics. But there is one more leg to the stool and it is critical to your balance. This leg knows that your planning is a continuous process and here is where the paradigm shifts. Planning is systemic; it is circular rather than linear. Most resources recommend that strategic planning take place periodically, once every 3 to 5 years. But in this new paradigm, once it starts, it never ends, because you should be constantly evaluating and adjusting to your progress. Where are we, where do we want to be, how do we get there… where are we… how do get there? Think holistically and look closely at what you can realistically do in the near future and then continue to tweak your plan. I’ve found that if you break your planning into easily digestible pieces, it’s much more palatable and productive. For more insight, give me a call, or pick up the book: “The Nonprofit Strategy Revolution”. Among all the research and approaches I’ve tried, this book was perhaps the biggest single influence that helped me appreciate the systemic nature of strategic planning. Consider starting your next plan as the beginning of an on-going process, one that cycles onward and upward towards your organizational growth, whether that's bigger, or better.